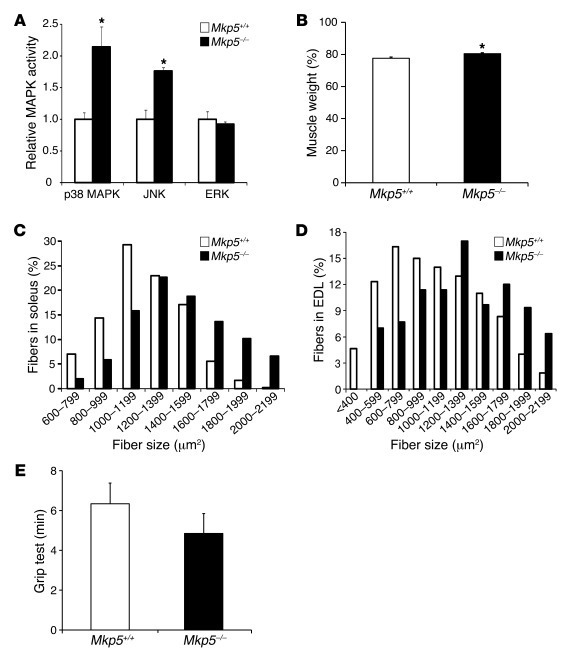 MKP-5 deficiency enhances skeletal muscle MAPK activity, muscle mass, and fiber size. (A) Fold change of MAPK activities in TA muscle measured by immune complex kinase assays (n = 4 littermates per genotype). (B) Whole-body muscle composition in 8-week-old male mice were analyzed using a Bruker’s minispec Whole Body Composition Analyzer (n = 7 per genotype). (C and D) Histograms of muscle fiber size in soleus (C) and EDL (D) muscles. Five hundred fibers from 4 littermates were counted per genotype. (E) Grip test. Mice were assessed for limb strength (n = 7 per genotype). Results are the mean ± SEM. *P < 0.05 compared with Mkp5+/+ mice. (A–E) Represent data collected from 8-week-old male mice.